oining a dating site after splitting with an ex doesn't have to be about seeking a relationship. More likely, i's a comfortable means to find someone to grab a drink with, get dressed up and remember how much fun it is to flirt with someone new. Joining a dating site after splitting with an ex doesn't have to be about seeking a relationship. More likely, i's a comfortable means to find someone to grab a drink with, get dressed up and remember how much fun it is to flirt with someone new. No one can tell you the perfect time to get back to dating, but we can offer a bit of guidance into where to head to. 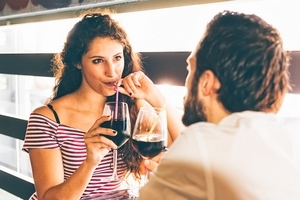 Check out our list of the 3 best dating sites to help take your mind off a breakup. Rejection is an awful feeling and (this is actually based on evolution) our bodies process rejection by basically shutting down. Counter this by putting on a brave face, and going out with someone who can provide a much needed distraction. The perfect place to find that distraction? Elite Singles is a dating site aimed at educated singles - 80% of members are university grads - and if you’re looking to lose yourself in stimulating conversation this might be the site for you. When you’re in a relationship for so long, it's easy to forget that energetic, hypnotic feeling of new conversation and sexual tension. Let Elite Singles remind you what that's all about. As the most popular dating site, Zoosk can provide a recently broken heart with lots of attractive...options. And Zoosk users are extremely active - the site has 38 million singles worldwide and there are 11 million messages sent every day. Because sometimes the best cure for the blow to your ego that comes with a breakup may just be logging on to a dating site and seeing five messages waiting in your inbox. You might think Match is an odd choice for this list. The dating site puts a strong emphasis on helping people find long term relationships - something you might not be interested in after a breakup. But what Match does really well is their offline events - game night, cooking classes, speed dating. It’s really easy to get stuck in the swiping and chatting phase of online dating and never take that chemistry from screen to street. With Match, you’ve got a good excuse to put your phone down, leave the house, and meet people in a really comfortable environment.